I have been negligent about updating this web site. 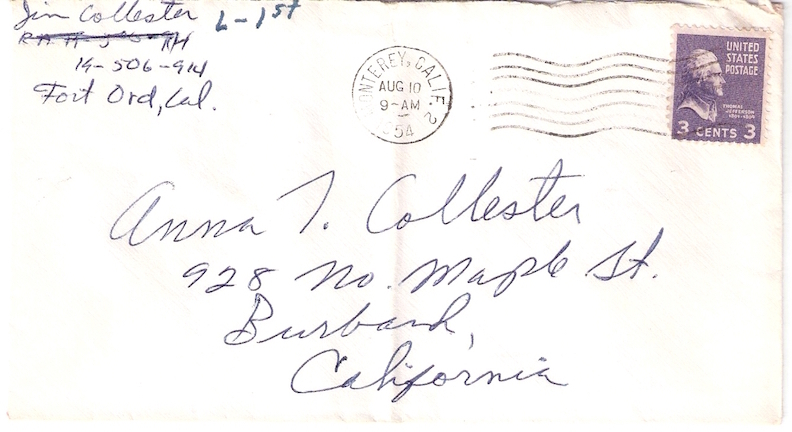 So, finally here is another letter from Jimmie Lee Collester. 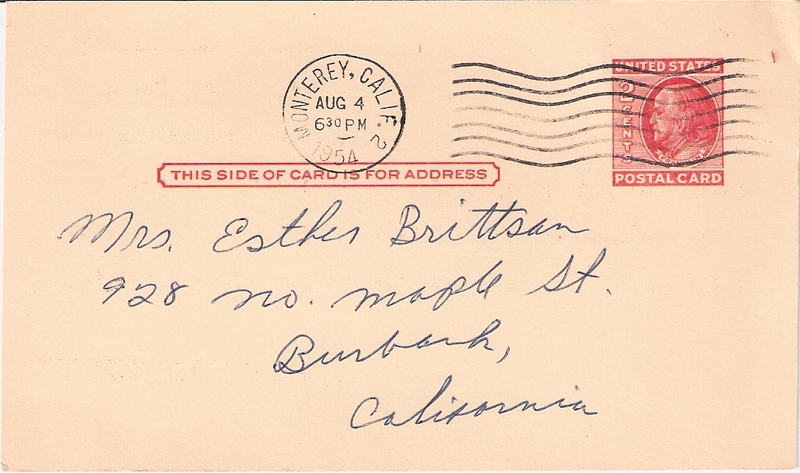 This letter is postmarked August 14, 1954. 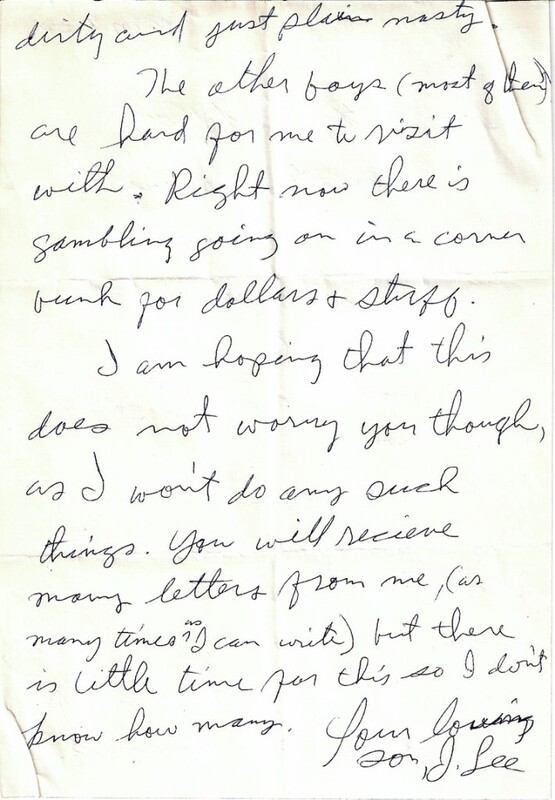 It is a noticeably longer letter than any past ones thus far. So he must have been feeling a bit better. 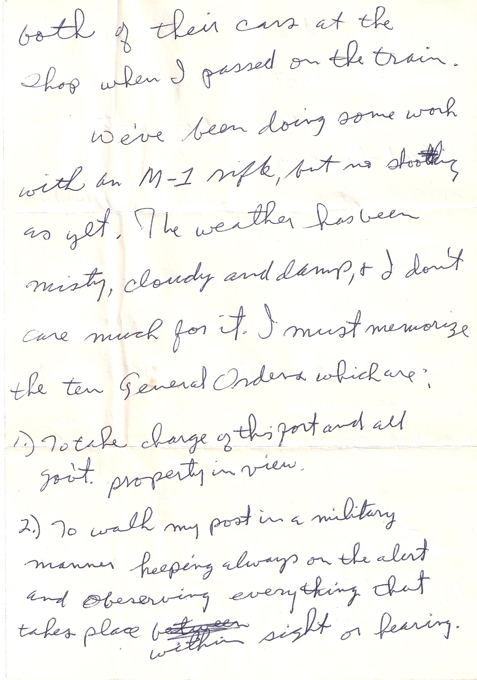 I found one thing amusing; He writes out the “Ten General Orders” he is supposed to memorize in Basic Training, yet he actually gives us Eleven orders! I don’t know if this was a little trick the Army was pulling on him or if he merely didn’t realize he was given 11 orders to follow. 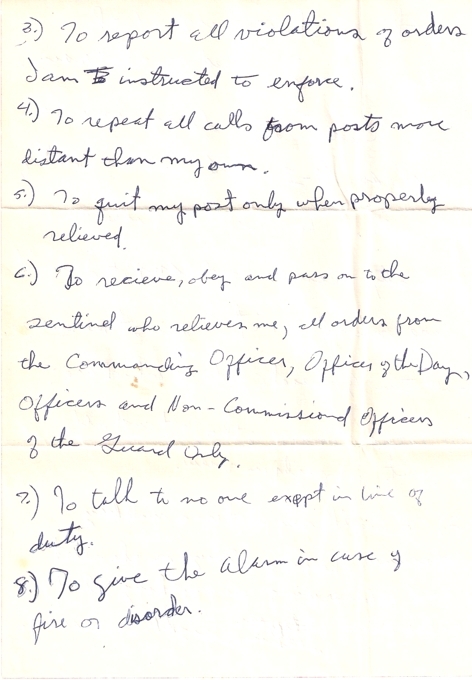 By the way, I believe these General Orders still are followed exactly the same today, though each branch has slightly different wording. I’d like you to write now as I guess I’m as used to this place as I’ll get. I sure miss home, but I try not to think about it. that is put on by us. Norm told me about it. 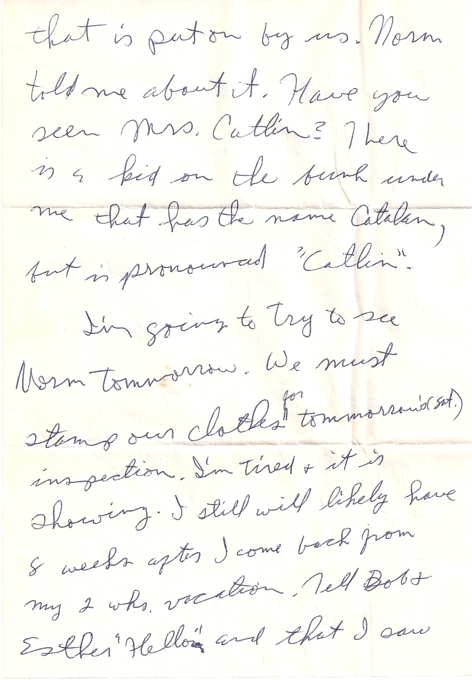 Have you seen Mrs. Catlin? There is a kid on the bunk under me that has the name Catalan, but is pronounced “Catlin”. both of their cars at the shop when I passed on the train. 1.) To take charge of this fort and all gov’t. property in view. 2.) To walk my post in a military manner keeping always on the alert and observing everything that takes place within sight or hearing. 3.) To report all violations of orders I am instructed to enforce. 4.) To repeat all calls from posts more distant than my own. 5.) To quit my post only when properly relieved. 6.) To receive, obey and pass on to the sentinel who relieves me, all orders from the Commanding Officers, Officer of the Day, Officers and Non-Commissioned Officers of the Guard only. 7.) To talk to no one except in line of duty. 8.) To give the alarm in case of fire or disorder. 9.) To call the corporal of the guard in any case not covered by instructions. 10.) To salute all officers and all colors and standards not cased. 11.) 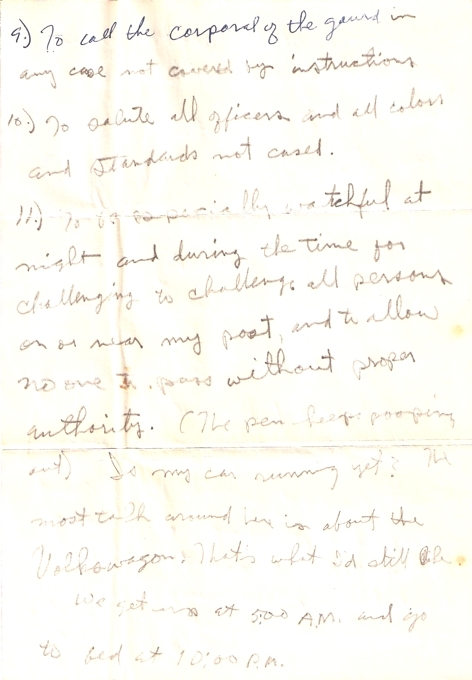 To be especially watchful at night and during the time for challenging to challenge all persons on or near my post, and to allow no one to pass without proper authority. Is my car running yet? The most talk around here is about the Volkswagen. That’s what I’d still like. We get up at 5:00 A.M. and go to bed at 10:00 P.M.
We are really kept on jump so I’ll likely only write once a week. (Likely Sat. or Sun.) But, for sure then. Tonite is the last night for Company “K” to be here. (The next barracks) Some are shipping out for far East, some to Europe, some to school. Please tell everyone hello and that I’ll write to them soon. This place isn’t too bad, but the 12 different calisthenics ranging from various jumps to the 8-count push up is hardest for me. The non-commissioned officers are the best of the bunch. 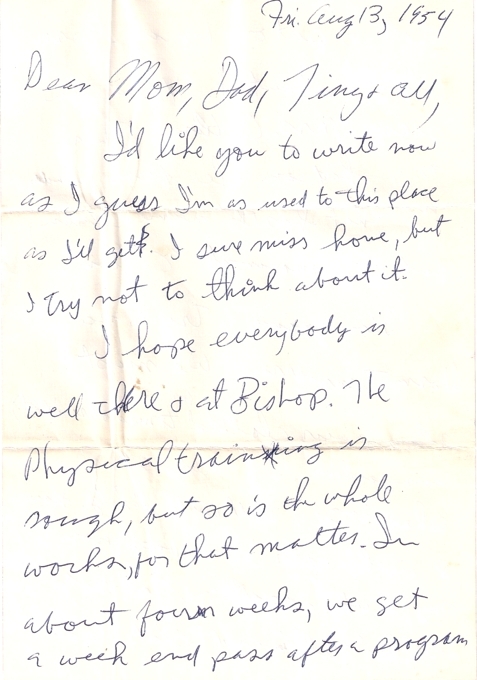 I am posting a letter today which will be out of order with the other letters I have been posting. I just wanted to post in honor of my Father, Jimmie Lee Collester’s Birthday. If he were still alive, he would have been 80 years old today. 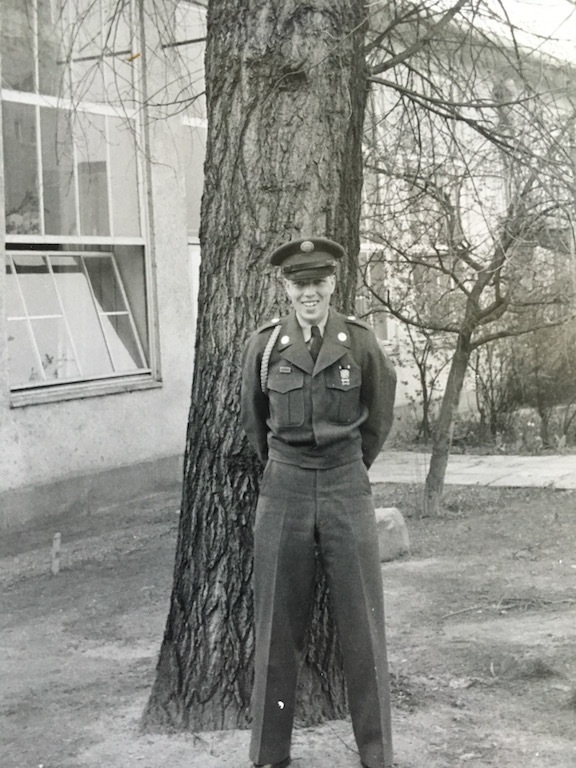 Back in May 1955, he was stationed in West Berlin. 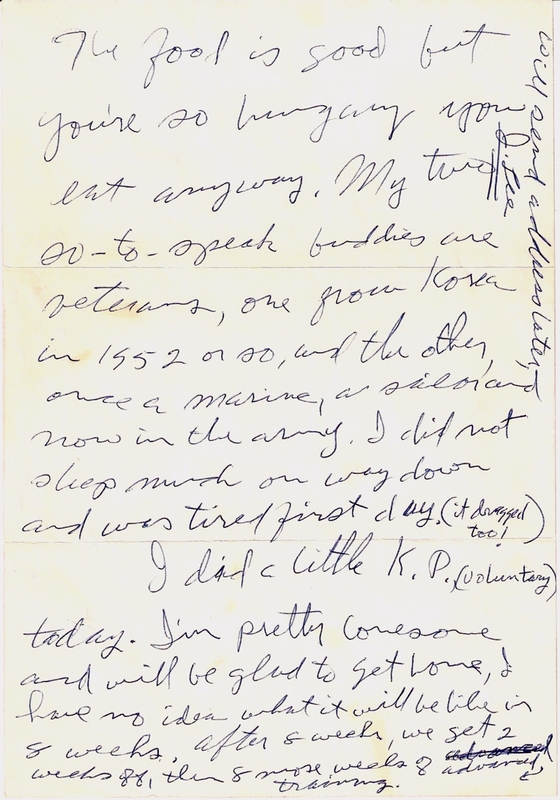 His birthday fell on a Thursday, so it would have been just a regular day in the life of a soldier. Well, it was nice here today. I haven’t got one thing to say. I’m listening to some of my records. The 1st Platoon went to the Zone today. “Dog” company (Co. D) all have “Mohawk” haircuts, even the Lieutenants, I hear. I did receive all of the money. I hope you are all well. I saw my AGCT test grade, it is only 103, but I guess it is okay. A lot of guys are lower by far. We go to the Zone soon, as I mentioned, so I hope it is nice & warm down there. 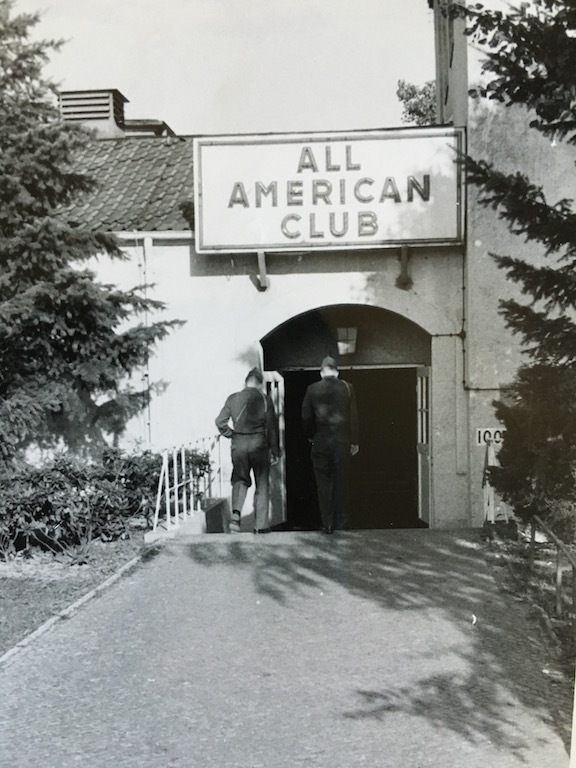 On the 26th they have an inspection and I have guard at the service club. Oh, well, it can’t hurt my birthday anyway. It sure has been raining a lot here. It about half snowed. 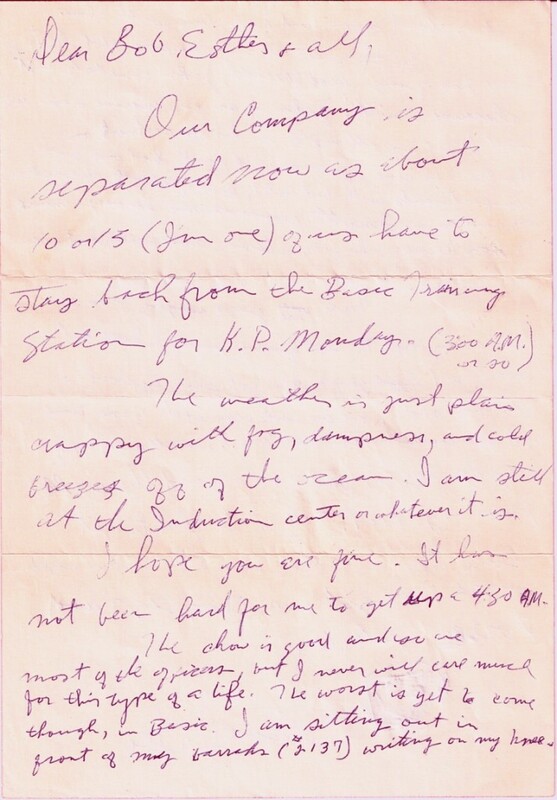 This letter was dated August 10, 1954. It really displays the home sick feelings my Dad had again. What is somewhat humorous about this, is that he insisted that nobody write since it will make it easier, yet he asked a question about whether they got his letter… which would require them to write in order to answer. Poor guy. Enclosed is $10.00 $5.00 I did not need. I got $20.00 the other day. I have also come across his daily journal from this period! 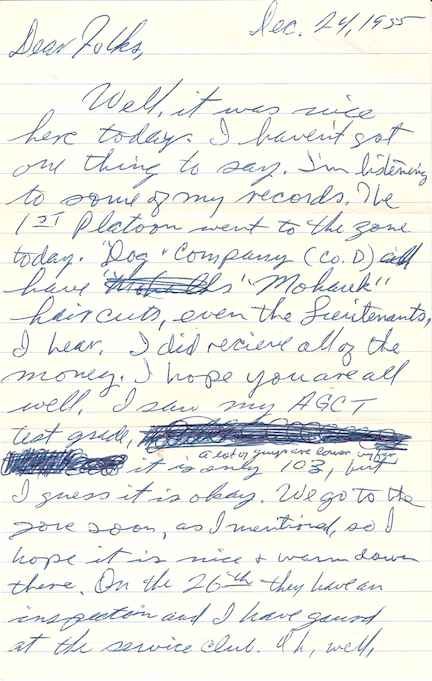 This gives me more insight into his activities which perhaps he didn’t share with his letter recipients. So, you can see that he was very homesick; so much so that he couldn’t eat. One other thing I noted from this journal, is that the Army emphasized going to church to the soldiers. I wonder if they still give “orientations on going to church” in the Armed Forces. 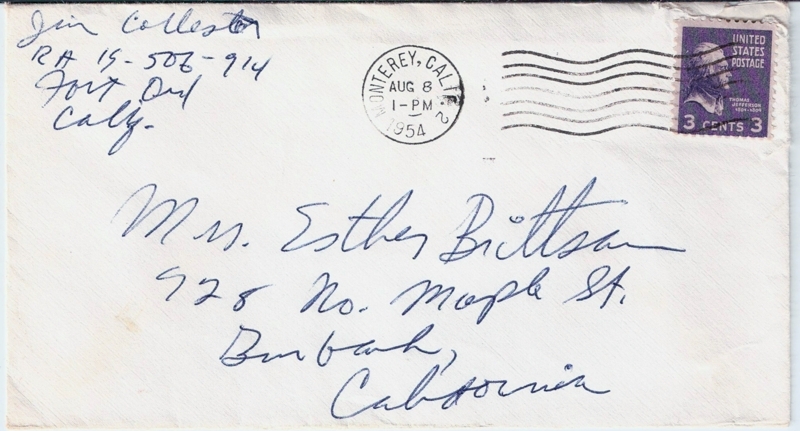 Here’s another letter addressed to Esther Brittsan. I haven’t a clue how I can find out the story behind this. 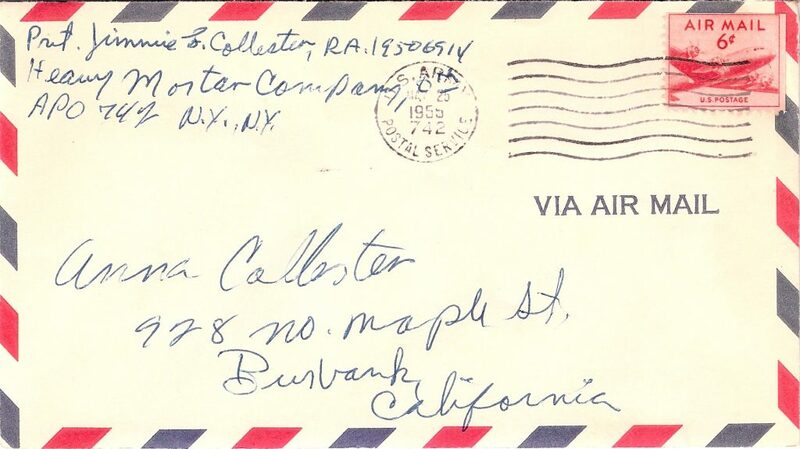 Perhaps they were staying with Jim and Ann Collester for a time and Jimmie just decided to address the letters this way. Since Jimmie and the addressees are all deceased it would be difficult to ascertain. Apparently Jimmie Lee Collester, at this time, also did not enjoy the foggy coastal weather of California. 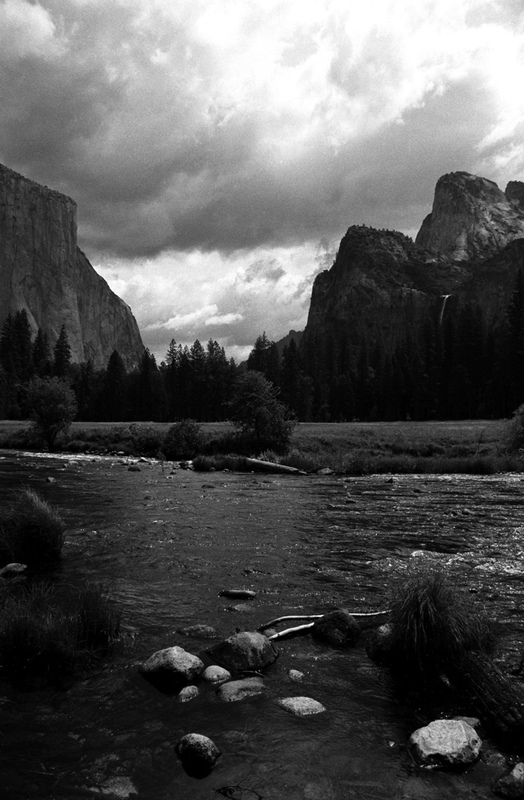 The interesting thing is that he later moved to a not too dissimilar climate in Oceano, CA. The weather is just plain crappy with fog, dampness, and cold breezes off of the ocean. I am still at the Induction center, or whatever it is. I hope you are fine. It has no been hard for me to get up a 4:30 AM. The chow is good and so are most of the officers, but I never will care much for this type of a life. The worst is yet to come though, in Basic. 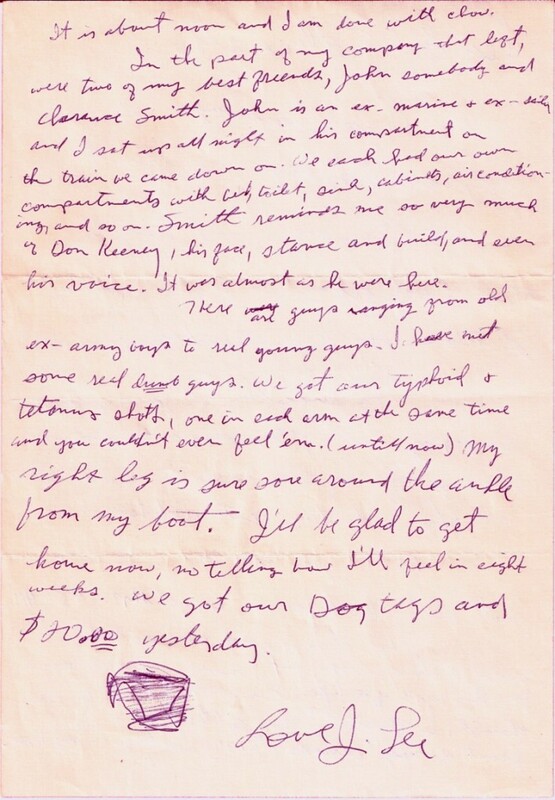 I am sitting out in front of my barracks (#2137) writing on my knee. It is about noon and I am done with chow. In the part of my company that left, were two of my best friends, John somebody and Clarence Smith. John is an ex-marine & ex-sailor and I sat up all night in his compartment on the train we came down on. We each had our own compartments with bed, toilet, sink, cabinets, air conditioning and so on. Smith reminds me so very much of Don Keeney, his face, stance and build, and even his voice. It was almost as he were here. There are guys ranging from old ex-army boys to real found guys. I have met some real dumb guys. We got our Typhoid & tetanus shots, one in each arm at the same time and you couldn’t even feel ‘em. (until now) My right leg is sure sore around the ankle from my boot. I’ll be glad to get home now, no telling how I’ll feel in eight weeks. We got our Dog tags and $20.00 yesterday. 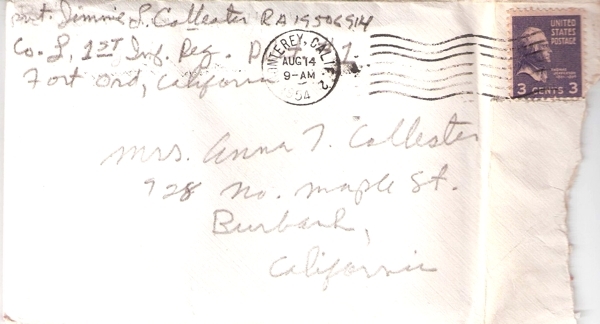 After too much delay, here is another letter from Jimmie Lee Collester while in the Army. 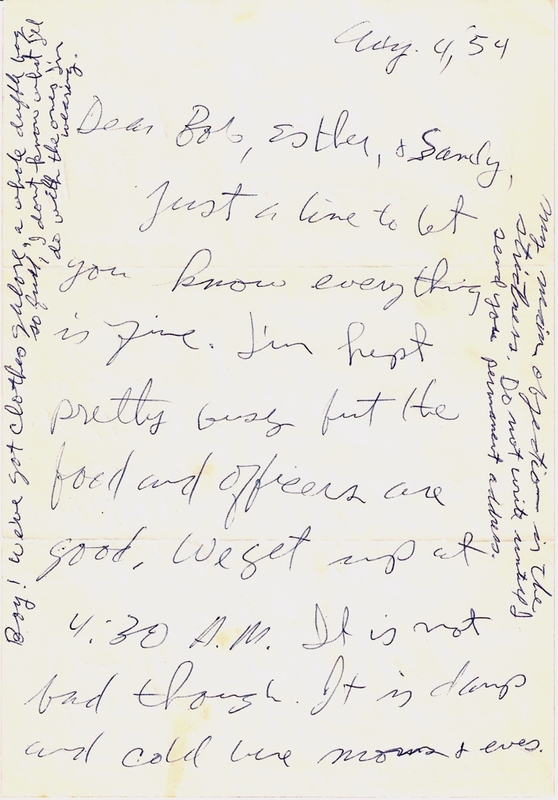 Again, this one is interesting in that it is directed to his Aunt, Uncle and ‘Sandy’, yet the letter is sent to his parents’ street address. Just a line to let you know everything is fine. I’ve kept pretty busy but the food and officers are good. We get up at 4:30 A.M. It is not bad though. It is damp and cold here morns & eves. Boy! We’ve got clothes galore, a whole duffle bag so full, I don’t know what I’ll do with the ones I’m wearing. My main objection is the strictness. 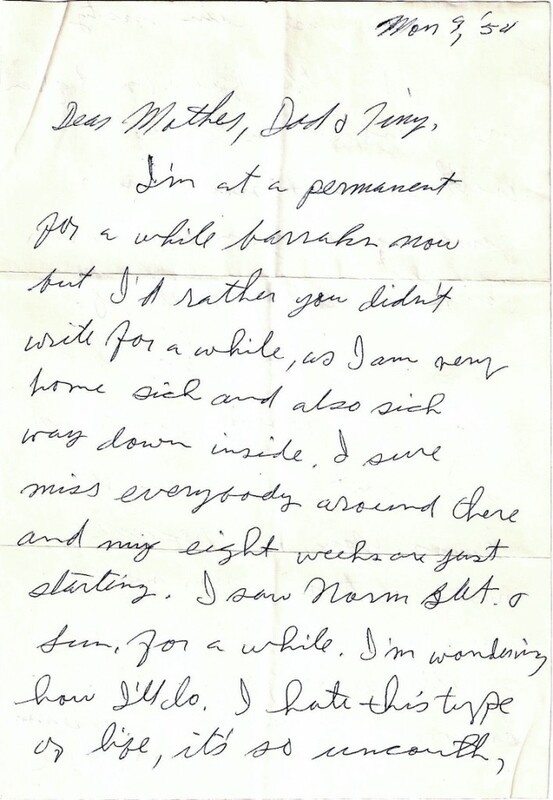 Do not write until I send you permanent address. I did a little K.P., (Voluntary) today. I’m pretty lonesome and will be glad to get home, I have no idea what it will be like in 8 weeks. After 8 weeks, we get 2 weeks off, then 8 more weeks of advanced training. 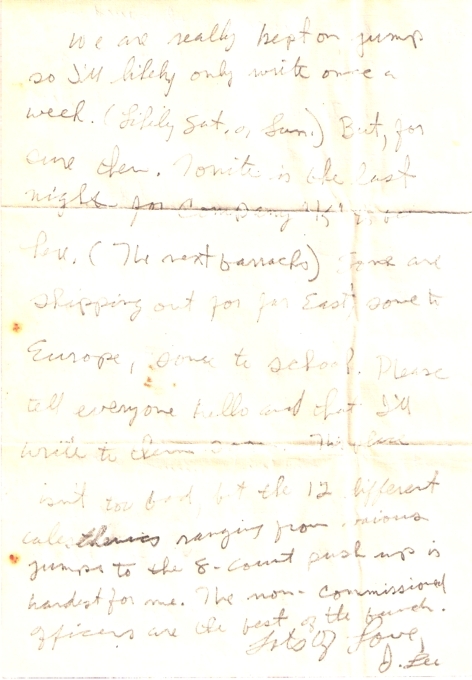 Here’s the first piece of mail which was received from my Father when he was inducted into the Army. 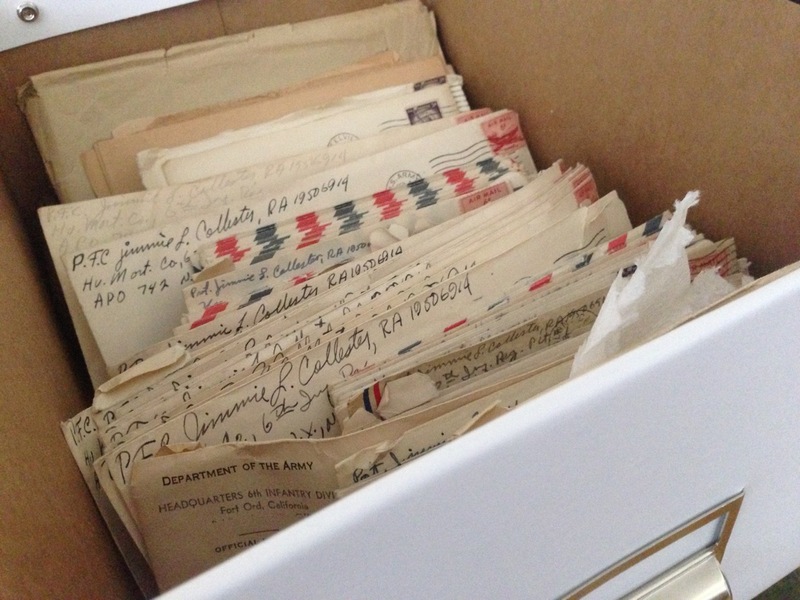 It was a pre-printed postcard which the soldier simply filled out to be sent home. 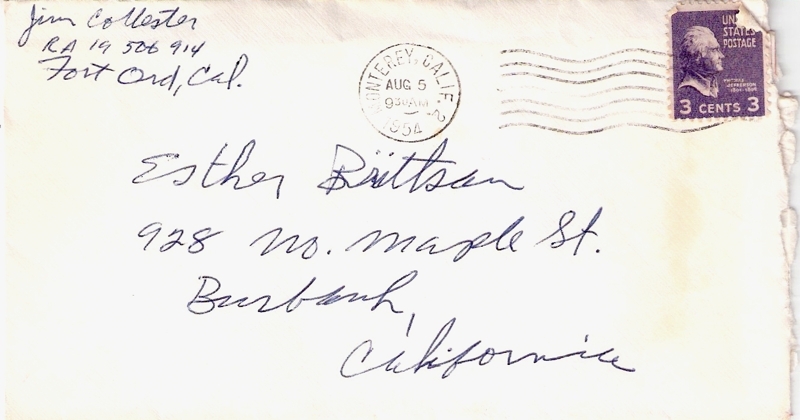 Interestingly, this was not addressed to my Dad’s parents, but rather to his aunt Esther. 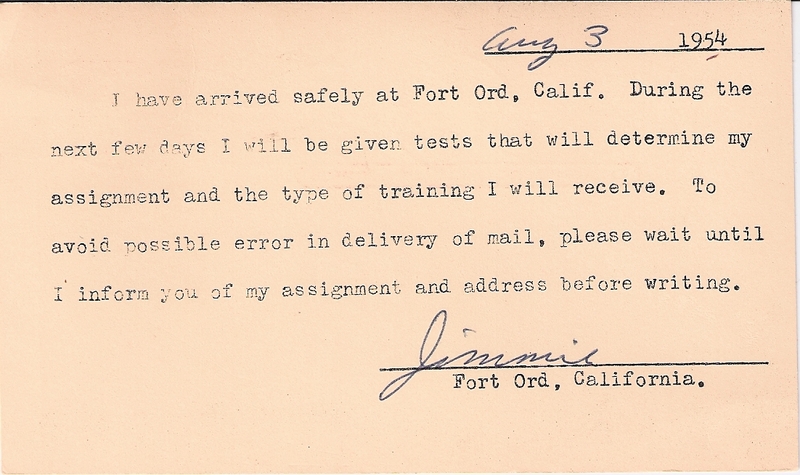 I have arrived safely at Fort Ord, Calif. During the next few days I will be given tests that will determine my assignment and the type of training I will receive. To avoid possible error in delivery of mail, please wait until I inform you of my assignment and address before writing. Hello all. I don’t know who “all” is, since I assume nobody will actually read this. However, just wanted to get my site up and running and decided putting up a WordPress blog was a start.